It may stay like that for 10, 20 minutes, and do nothing. The most annoying thing is that I’m trying to correct a mistyped SQL in the question, at least in this example, and I’m not being able to. And then, the most critical one, metabase simply stops. I run my instance from the jar file (currently on 0.29.3, still looking for agood moment to switch to 0.30, given it introduces major lauyout changes), in a debian, on Amazon EC2. The logging simply stops, and no relevant info is shown at the end. I though it might be due to java virtual machine memory, but my jenkins instance, also in java, is still running alright - problem is with my metabase instance (not with my browser or machine, it goes down for everyone in the company, in any browser, and, given the log is quiet, I think it is really gone, despite the process being running). Any light on these issues? I’ve come to the point that we’ve created a custom command on our EC2, “metakill”, which kills metabase process and restarts it, so often it happens. 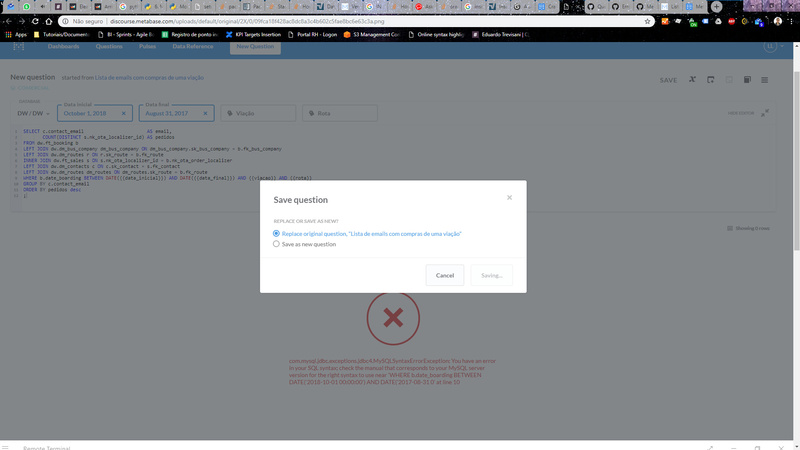 For some reason, I cannot save a question once I have pasted the below query inside. Thanks!! I have metabase installed on centos. Metabase crashes silently and doesn’t leave any traces in the log. Just upgraded to the latest version, hoping it would stop silent crashing, but no luck. Any suggestions? This is in reference to Save question dialog box doesn't complete I REALLY REALLY need someone to look at this. Questions won’t save and it’s impacting our ability to service our clients. I updated the original question 5 days ago and haven’t received a response. Please advise. Thank you. I can’t find any help on either of these topics, nor workarounds. It is really depleting metabase functionality for us, since we can’t really guarantee it is available at the moment. EDIT: I was running metabase with the standard command, “java -jar metabase.jar” thing. Yesterday, I saw something in the logs related to OutOfMemory java error, and, then, I increased the memory alocated to Metabase process in the JVM, using something like “java -Xmx1024k -jar”. I’ve thougth of it as an idea stemming out of a Stack Overflow question reference below. So far, it SEEMS to have solved the crashing issue. EDIT2: no good on the crasing issue, even with the memory enhancement. Still crashing, and most of the time with no data on the logs - everything is running finely, and, all of a sudden, log goes silent. What are the Xms and Xmx parameters when starting JVMs? Yeah, the behavior is pretty much the same. Thanks for pointing out, I hadn’t come across that question on my googling. But, relating to logs, I can’t see anything that might be related to that. The most weir thing I see is “Card X doesn’t have cached read_permissions”, but I’m nearly sure that is not the cause. If someone finds it needed, I might upload some piece of log when I see that behavior. As for environment info, I’m running querying it mostly on Chrome, though I’m able to see the problem on Edge as well (both on windows OS, with, as mentioned before, metabase jar file running on Amazon EC2), querying against a MySQL database (also on Amazon). Seeing my MySQL running queries, aparently, even after you click “Cancel” on Metabase, the query is still running. Using the “kill” command on MySQL, to effectively terminate the queries, seems to help with the not saving problem. I’m still to confirm this, though. But, relating to logs, I can’t see anything that might be related to that. Hehe, that’s what you get when you ask two possibly unrelated questions and it’s easy for me to find a thread related to one of them. And yes root cause for the issue I linked above doesn’t seem like it’s nailed yet. May it be related to be running with h2 file, instead of SQL? Opened a diferent post for that doubt, it is linked to this one.